Higuain was left out of Milan's matchday squad for their first Serie A outing of 2019 due to concerns from head coach Gennaro Gattuso – who watched from the stands due to a suspension – over his mindset amid links with a move to Chelsea. Gattuso, punished for angrily confronting the referee after his side's Supercoppa Italiana loss to Juventus last week, saw the Rossoneri toil for much of the game. 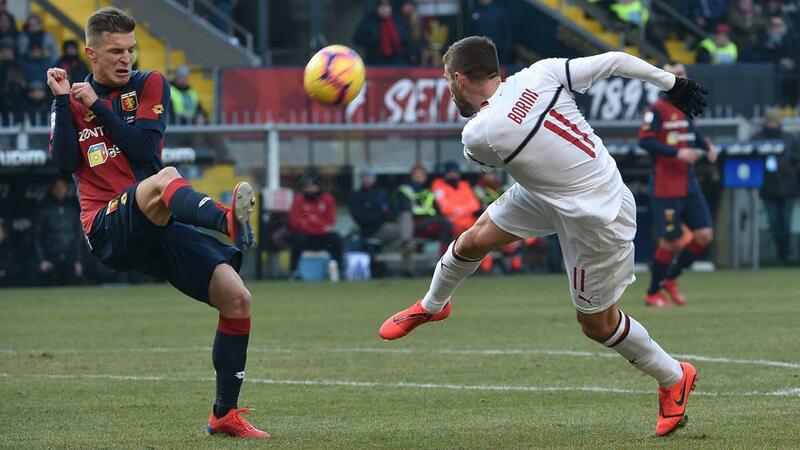 Further attempts from Goran Pandev - selected in place of supsended Milan target Krzysztof Piatek - and Daniel Bessa followed, the latter seeing a shot kept out by Gianluigi Donnarumma when through on goal as Genoa took control of the contest. Lucas Paqueta nearly fired the visitors in front late in the first half with a well-struck volley that skimmed the outside of the post, shortly after Domenico Criscito's deflected cutback was blocked by Donnarumma. Borini saw an angled drive tipped away by Ionut Radu, while Lucas Paqueta failed to make the most of a free header before Donnarumma's double save denied Christian Kouame and Bessa. Milan did find a way through eventually, however, as an unmarked Borini got on the end of Conti's cutback and converted from eight yards. The Rossoneri survived a scare when Donnarumma touched Miguel Veloso's shot onto the crossbar, but Suso wrapped up the points when he latched onto Cutrone's throughball and finished off the inside of the post.